Recording began for the third album again at MAC Audio (Craig's spare room) and featured songs conceived by Paul again but with others introduced by Craig. Again, the drums were recorded first in a studio environment with new drummer Vittorio DiIorio who, along with a phlegmatic demeanor, brought jazz-trained chops that are highly prized and appreciated by the other members. At last the band felt they had the musical recipe complete to create the ambitious, sprawling sound that they had longed for. 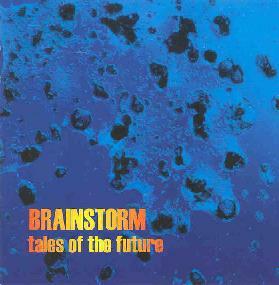 This album was a further extension of the approach used on Brainstorm Two Earth Zero to develop thematic elements within the larger work in an attempt to tie together the motifs and ideas that underpinned the works.The cover featured lyrics (as usual) but also a paragraph or two under each lyric that attempted to explain the explored themes of time, space travel and colonisation, cyber-people, connection to the natural world and war (our usual obsessions). Recording was once again an extended, time consuming affair. In fact, as the band grew and improved, the time taken to record has increased so that years of work are required to create a result that is as good as it can be considering the limitations of time, ability, money and knowledge. As ability grew and the recording equipment multiplied so did the time now required to complete the vast tracking and mixing of the project. The Otari 8 track had now been replaced by a Tascam model which was sonically similar but much more reliable and easy to maintain. Eight tracks is not a lot though when you are overdubbing and adding layers of texture so the band was now also synchronising this machine to a new computer which recorded and controlled most of the machines in the studio with the exception of the wall of old analogue synthesisers (now, sadly departed). Now the band felt in control of the music and was free to let imagination direct the music where it might go. As a collective founded on principles of fraternity and equality (liberty being taken for granted by white, middle class men from Australia) the band has always taken a collective/men's shed attitude to creativity allowing all to have a say and an impact on the outcome. This approach is one that allows for much discussion of the works and deeper meanings to be established through this process. It also precludes rampant ambition, wealth and success , well at least for us. Mostly, it chews up massive amounts of time. So it was with some frustration that the band realised we had taken some years to produce this recording. We may not play like Pink Floyd but we can record, er, as long as them. Eventually, the album was finished, after the now inevitable delays associated with creating and printing the cover, again assisted by James Carter. This time it was thought that the services of an objective ear would be used to master the album so Tony 'Jack the Bear' Mantz was located and the album was mastered by him.